Professional chefs and restaurants have been using sous vide as a method of cooking for decades. It has now become popular in home cooking especially now that affordable immersion circulators have been available in the market. Sous vide can is a relatively simple method of cooking that can be used at home to improve the way your meals or even desserts are cooked. With the sous vide method, you can have your steak cooked at your desired doneness without overcooking it. With sous vide, you just need a reliable sous vide machine and a sous vide container. Simply set the water inside the container to a corresponding time and your desired temperature. There is a wide array of options in choosing a sous vide container size including small jars to even a kitchen sink. 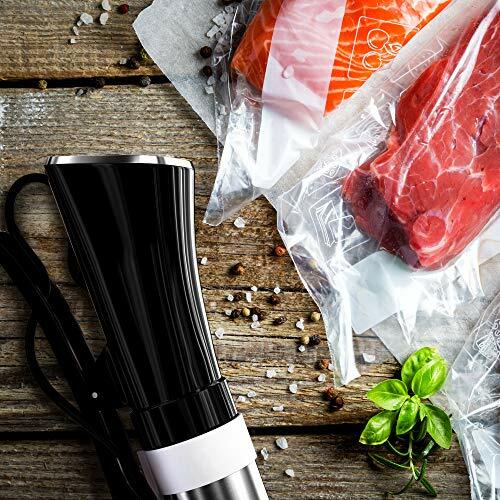 There are a couple of factors to consider when choosing the sous vide vessel that is best suits your sous vide cooking needs. It just depends on little details such as the type of food that you are going to prepare, the immersion circulator that you will be using, the volume and the quantity of food that you will be using for your sous vide, and a whole lot more. The size of the sous vide container will also depend on the factors mentioned above. Here is a list of different kinds of sous vide containers and their typical sizes. An ideal water bath container is a medium to large induction-ready metal pot. It’s alright if you don’t have this kind of pot. Any kind of pot would do. It should be at least 8 inches deep, 12 inches in diameter, and hold around 12 quarts. Sauce pans are generally smaller and have a long handle. They range from 1 quart to 6 quarts. Stock pans tend to be deeper and normally have two small handles on either side for easier lifting of heavy pots. They range from 6 quarts up to 150+ quarts. A medium-sized plastic cooler is another option for a sous vide container size. It should be at least 8 inches deep and hold between 12 to 24 quarts. Plastic coolers are insulated that’s why they can increase the temperature easily without requiring much power from the cooker. Polycarbonate containers are the most popular types of containers used for sous vide cooking. They are transparent, light weight, and come in different sizes and shapes. They are actually sold as food containers. The polycarbonate material allows them to withstand temperatures that are even greater than the ones used in sous vide cooking. Polycarbonate tubs are fancy looking clear tubs with a full range of sizes from 1 to 22 quarts. There are 2 popular sizes for polycarbonate containers used as vessel for sous vide. One measures 11 x 11 x 9 inches holding around 12 quarts while the other one measures 12 x 18 x 9 inches holding around 18 liters which is ideal for larger items. These polycarbonate containers are created specifically for sous vide. The lids of the LIPAVI containers have pre-cut holes to match each sous vide device. It’s just a bit pricey compared to other brands because it is more focused on the professional market than the consumer market. LIPAVI comes in two sizes: C10 – 12 quarts, and C20 – 26 quarts. Cambro has a wide selection of pans and containers that can be used for a sous vide water bath. The most popular water bath container though is the 12 quart container which measures approximately 12 square inches and 8 inches deep. Rubbermaid also offers a wide selection of of food containers but the price is definitely less expensive compared to the counterpart Cambro products. A big advantage of using Rubbermaid is that their products are BPA free. This is one of the highly recommended sous vide containers when using immersion circulators. They are dishwasher safe and the sides have clearly marked measuring lines. The commonly used sous vide container size is a 12-quart Space Saving Square Container that measures 11 x 10 x 8 inches. There is also a larger container, the 3-1/2 Gallon Food/Tote Box that measures 12 x 18 x 9 inches. Given these bunch of options for sous vide containers to choose from, your choice should largely depend on the type or kind of sous vide cooking that you normally do. If you get those containers that are improvised sous vide containers, you would need to cover these containers to retain heat. You can use a plastic food wrap, aluminum foil, a container’s cover that you can easily cut to match your sous vide machine, or even a bunch of pingpong balls.